The Art of Letting Go ~ Father God, 11 April 2018. 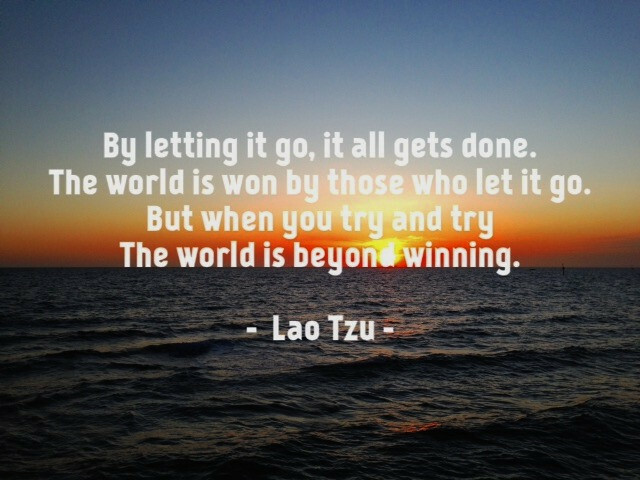 I would like to help you all remember the ancient art of letting go. Now some of you may be wondering why is it so important to let go and let Me take over? So much so that today there’s another message addressing this topic. Sananda had also recently discussed this art of ‘surrendering’ in his last message through this channel. His message had served as a good introduction for me to build and expound on. It is important that you all realize that today’s message is THE KEY to: shatter and destroy ALL POWERFUL third-dimensional beliefs that are holding you back. 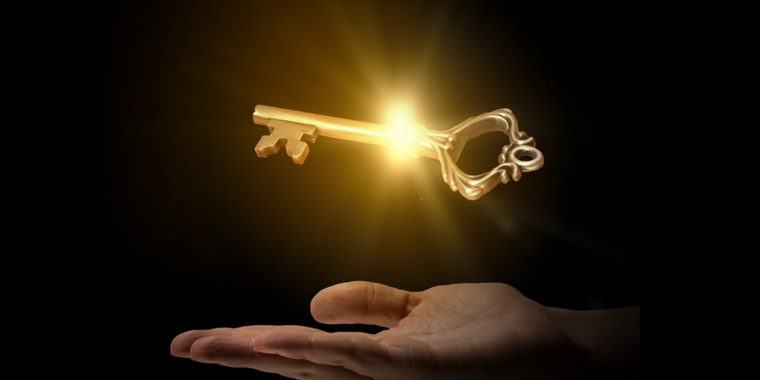 It is a precious, golden key I now give unto you, my beloved children, to unlock the previously-hidden door to where your higher dimensional powers of Creation and Manifestation reside. 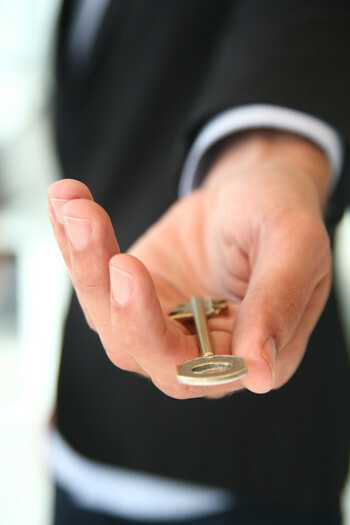 It is also a magical key that, when used, will open the doors to the Kingdom of Heaven on Earth. What you will do after reading this message, after receiving this key? Will you throw it out and forget it ever existed? Or are you ready to take that extra step of faith, with courage, bravery and commitment to ‘jump off of the cliff’ NOW and leave behind: your old ways, old beliefs, old habits and all your deeply-entrenched, 3-D way of being, thinking, feeling and doing? I tell you now solemnly: ‘This task is NOT for the faint-hearted’. Accepting this key today symbolizes your total surrender, faith and trust in Me, in your Higher Self and in the Universe. Only accept it IF you are ready. Take a few deep breaths now and visualize Me standing in front of you now, extending my hand and offering this golden key to you. And here comes the key that will unlock the higher-dimensional part of you that has long been forgotten whilst living on 3-D Earth. Will you take it from my hand and make it yours? I KNOW all of you who are reading this. I know your true readiness levels and your true degree of willingness to change your life. I know exactly how many of you have accepted this key and truly made it yours. I also know some had accepted it but will later forget its existence and return to their old third dimensional ways. Some of you are also not ready to receive this key, and that is completely fine. It does not mean that you will never be ready. It just means that today, you are not. The fact that you have kept reading this message tells me that soon, you will be ready. There is only ONE reason why someone will eventually forget this key ever existed, or why they are not yet ready to accept it. That reason is FEAR. Fear of change. Fear of the unknowns. Fear of losing the stability and security that you are currently enjoying. Fear that the road less traveled we will be leading you to will be totally different to: where you want to go, what you want to be and what you want to do/have. Fear is a powerful third-dimensional illusion that keeps you small and complacent. The presence of fear in a particular aspect of your life is a powerful reminder that you need to ‘let this fear go’ to not only move on to better paths, but also to grow as a person; to grow bigger into your Highest Potential. You now have two options to choose from, in the face of your fear. What will you choose, my beloved? Option 1 or 2? 2) F.E.A.R -> FACE EVERYTHING AND RISE. For those of you choosing the second option, well done! Listen to, or ‘feel’ the applause the entire company of Heaven is giving you right now. Your willingness to: not only accept the key but also choose to ‘face everything and rise’ is a strong indication that you are now ready to embrace the Highest Potential of what you can be, do and have in this current lifetime. And your Highest Potential is INFINITE. It is everything that you can currently imagine and yet so much more. You are all GODS and GODDESSES. You are the physical expression of Me. I AM ALL THAT I AM. I AM UNLIMITED. I AM GOD. And WHAT I AM, YOU ALSO ARE. The Sacred Process of: Remembering -> Knowing -> Understanding -> Becoming -> and then finally, Embodying this greatest, spiritual truth is THE KEY to unlocking your UNLIMITED Divine Powers of Creation and Manifestation. The information I just gave you above is the biggest secret to Spiritual Mastery and Enlightenment that all of your Ascended Masters/religious masters had discovered and mastered in the past. Once upon a time, this ‘highly-classified’ spiritual knowledge used to be taught only to the select few: the highly devoted and dedicated ‘initiates’, or committed students of Mystery Schools around the globe. Now please be honest with yourself my beloved. Whereabouts are you located in the above process? Are you in the ‘remembering’ phase; the ‘knowing’ or ‘understanding’ phases; the ‘becoming’ phase or the ’embodying’ phase? 99.99% of you reading this will likely find yourself in the first four phases. That’s because most of you reading this are the ones still in the process of aligning and becoming your Higher Selves. Those of you who belong to the rare, 0.01% group: you just happened to be reading this message not because you need to know/learn more. You are here just to get a confirmation of what you have now fully become. Not that you actually need this confirmation because all the Wisdom you will ever need, you’d already found within. It is just nice to keep up to date with what’s going on with planetary spiritual growth level. Please go back to where we were earlier. Me offering the key in my hand, and you accepting it. Now that you know the Higher Truth of what this key is a symbol of, please place your entire FOCUS on this beautiful golden key you are now holding. intense, golden white light. Those three powerful statements have now filled and imbued the key with My OMNIPOTENCE. The last step is the most important. You now need to imagine this beautiful, intensely shining golden key completely MERGING and BECOMING ONE with your hand that’s holding it. It is then immediately becoming one with you; with your entire physical body and energy field. Once the integration process is complete, just sit still for a minute or two. Feel the super-powerful effects this visualization exercise has on your 3 systems: the physical, mental and emotional bodies. It is literally changing you from the inside out. This beautiful golden key has now merged with all your cells, right down to your very DNA. It is now doing its job to ‘activate’ the previously sleeping ‘God-sequence‘ hidden in your DNA. What do you need to do next to make sure that after being activated, your Divine powers will not go dormant again? The answer is simple my beloved. Do the above powerful visualization at least once per day. Once you get the hang of it, the process should only take about a minute or two out of your day to complete. Also, verbally say and mentally think all the words in those 3 highly-potent statements often throughout your day; in your spare moments. In the morning as soon as you awaken and at night right before you fall asleep are two most powerful times of the day to say these ‘affirmations’ and have them sinking deeply into your subconscious. Keep doing these visualization and affirmations for at least 21 days, and see the miraculous effects they have on your entire being/life. There is one BIG difference between ‘dreamers’ and ‘creators’. Dreamers are happy just dreaming/fantasizing about: a better life, or a more successful future, or living in a 5D society of Nova Gaia. They are just continuously dreaming and dreaming but not taking any action to make their wishes a physical reality in their lives. Creators, on the other hand, are visionaries. They ‘envision’ a happier, brighter, more peaceful & abundant future and then actively participate in making this future happen! My beloved, are you a dreamer? Or a Creator? Are you ready to reclaim your Divine birthright? Are you ready to take your powerful place in the Cosmos as the ‘Movers and Shakers’; as the awakened group of Light Beings who are holding the fate of Humanity and Gaia in their very capable hands? I am here to request your full commitment and dedication to this cause. I am giving all of my children an open invitation to enter the Kingdom of Heaven on Earth. Will you now accept my invitation? Are you ready to? You may be wondering why I can’t just pull you out of this 3-D Earth and then ‘chuck’ you straight into 5-D Earth immediately. Why do you all have to go through this sometimes exhausting, often confusing, occasionally painful, chaotic process of Ascension? The answer is simple. Doing so will disempower you. This is YOUR life journey. You are here to experience, create, manifest, learn and play. You are here on a grand adventure that has never happened before elsewhere in this Universe. The Ascension of a planetary being that is Gaia, your Earth Mother, along with all of Her inhabitants. Everything that you had gone through in this life (and past lives here on Earth and elsewhere) and everything you are going through now made up the totality of WHO YOU TRULY ARE: ‘a magnificent, multi-dimensional eternal Spirit on a never-ending evolutionary journey to infinite potentials’. So why should I interfere with the soul growth process and the Divine Plan that YOU yourself had made, prior to being born here on Earth? This interference, no matter how well-meaning, will be in direct violation of one of our most Sacred Universal Laws: the Law of Free Will. So we will always be there to support you every step of your way, within the limits that you have told us would be acceptable to you, before you incarnated here, and that which we are able to offer within the constraints of the Ascension process. Planet Earth Herself, and most of Her inhabitants are now going through a deep, intense cleansing and detoxification process to release and heal everything that is no longer serving their Higher Self/Purpose. People everywhere are being forced to face all their deeply entrenched issues coming from the past. All who are not currently aligned with their Higher Purpose will find themselves at a major crossroad as a lot of things are shaken up to spiritually awaken and reclaim their Divine power. For example, a lot of people have recently lost their jobs, their marriages, their wealth, their health, their self-confidence and their previously ‘normal’ ways of living. This is not a coincidence. It is all part of the Ascension process. If you are one of these people currently going through a tough time, please remember you have everything within you to come out of this completely victorious! The future may seem bleak to you at the moment or it may seem like there is no way out. That is just an illusion. It is really just FEAR talking and rearing its ugly head. My advice to all of you reading this today is simple: LET GO AND LET GOD. Following this simple advice should be THE RECURRING THEME every moment of every day. Your Ascension process will be so much smoother, easier, more relaxing, fun and abundant if you just let go of all controls and give them to Me/your Higher Self. Even if you are well ahead in your Ascension journey and have started to become your Higher Self, you will still do well to remember this simple truth. Your movement forward from ‘Becoming’ to fully ‘Embodying’ your Higher Self will be such a breeze if you surrender all controls. Let go of all impatience. Impatience directed at yourself, at the world around you or at the Ascension process itself does not serve you at all. If anything, it adds to all the negativity already prevalent on this beautiful Planet. Sunset at beautiful Sandringham Beach, Melbourne. The image chosen by this channel to represent my message today is highly symbolic to what I would really love all of you to do from now on. Some Asian cultures have festivals during the year where they release sky lanterns (called ‘kongming’ lanterns in China, or ‘khom loi’ in Thailand) into the air, to symbolize: the presence of hope within their hearts and the release/the art of ‘letting go’ of all their fears, problems and worries. 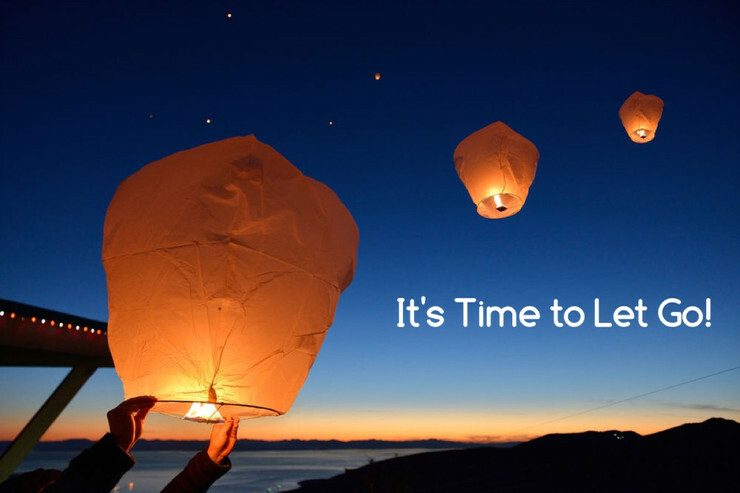 Imagine that you are now in possession of a beautiful sky lantern of your own. Visualize holding it in your hands, and grab a pen and write all your major challenges, worries, doubts, concerns and fears across all the sides of the rice paper lantern. Light the flame and then gently release. In your mind, set a powerful intention for this floating lantern to reach Me and your Higher Self. As you watch your sky lantern floating towards the heavens, make the intention to permanently release everything that you had written on it, for good. And mentally ask for our assistance in making this happen. The only way you’ll get rich is by working hard for your money. You are powerless in the face of your physical disabilities. You must have done something ‘wrong’ in your past life to deserve being born blind, deaf or mute. You are unable to grow back lost limbs; unable to heal unhealthy organs; unable to heal your body of all serious diseases such as cancer. Your bodies age as you get older and then you get sick when it’s time to die. It is impossible for a 60-yr-old to reverse all signs of aging and physically appear like a 30-yr-old. You are unable to instantly travel from one location to another halfway across the globe via the power of your mind. You can only get rich or get ahead in life if you are young and physically attractive, well-educated, wealthy and possess the ‘right’ skin color. God needs to be ‘worshiped’ and glorified. There are many more limiting 3-D beliefs that the Human Collective needs to let go of, in order to reach their Highest Potential. If you cannot ‘think, feel, believe or do’ outside the third dimensional box you had been living in for your entire life, then you will never be able to grow into the powerful, multi-dimensional Light Being that is your true identity. It is time to release ALL that are shackling and keeping you down! I realize that it is very hard and super challenging to release all the above, lifetime beliefs. After all, you have mostly accepted these beliefs as ‘true’ based on your own observations and societal conditioning in your entire lives. One message from Me saying those are ALL false beliefs is not going to do much in changing such powerful, very long-established mindsets. But for those of you here who truly believe in the existence of your Divine Powers of Creation and Manifestation, I will now share the secret in overcoming those powerful beliefs/conditioning. Here it is: DON’T EVEN BOTHER TRYING TO OVERCOME THEM. There are too many of them, and all of them are too deeply ingrained into your subconscious. It will take too long to face and release them one by one. You just need to replace ALL of those deeply-ingrained, third dimensional false beliefs with ONE powerful belief that overrides them all. And here it is again: I AM ALL THAT I AM. I AM UNLIMITED. I AM GOD. You have to fully commit to do your best in EMBODYING the above statements. This is THE KEY to your Divinity, your Sovereignty. Are you up to this challenge? Is your entire being; your mind-body-spirit, now ready to embrace its God-like potential? Are you ready to FINALLY leave behind all feelings of smallness, powerlessness, worthlessness or unworthiness, to then COMPLETELY, once and for all, EMBRACE your Godliness, Divineness and Powerfulness? If a strong, immediate and decisive YES is your answer, then my beloved, please take both of My hands now. Let go of everything that is holding you back, and trust in Me. Surrender your life completely and turn it over to Me. I will look after you, guide you, protect you every step of the way, and make sure that you will reach the destinations wherever you would like to go. All you have to do now is to: TRUST Me completely. This is your MISSION should you choose to accept it. The ball is in your court.